Behind on updates, but here are some quick shots of a game of 5 Core Skirmish with my wife's nephew over Thanksgiving weekend. We played Space Marines versus Orks, and he pulled off a win with the Space Marines. The rules were darned easy to teach and we were up an playing in no time! Alexander Crowley craves power, and his esoteric studies across the globe at Oxford, Miskatonic University, the South Pacific, and the dusty reaches of Central Asia have given him what believes to be the key. With the knowledge he has and the powers he has gained, he just needs to retrieve a few more esoteric artifacts scattered around the world before he can fully open the door and let the Old Ones return from dimensions beyond time and space, to cleanse the world with madness. Ia, Ia! Cthulhu Fhtagn! 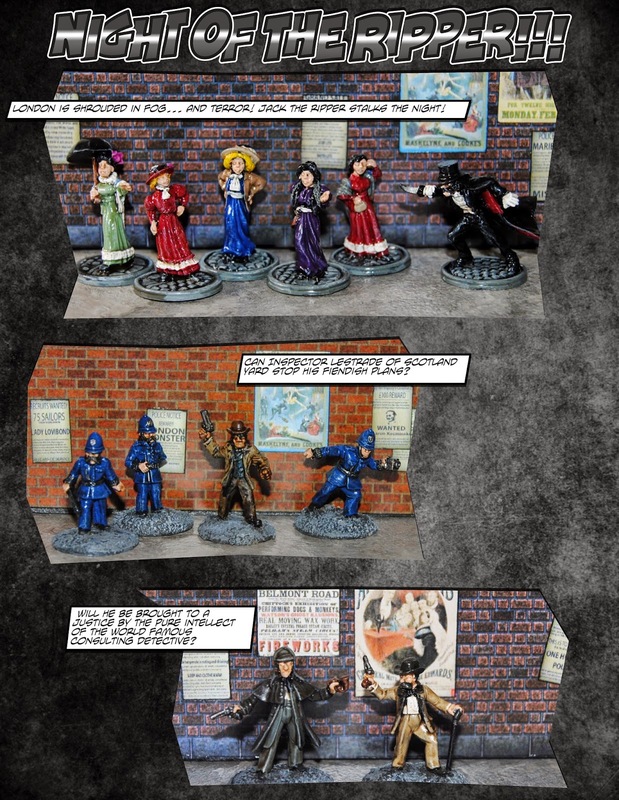 This IHMN Company was inspired by Bob Murch’s Pulp Figures and can be built (almost) entirely with packs from his company. Here are the codes, you can find them at www.pulpfigures.com. 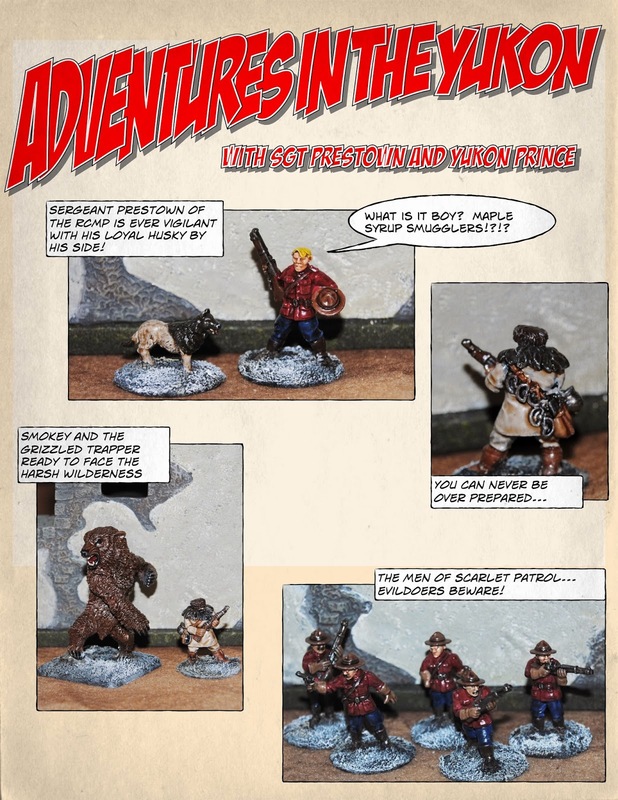 (I am not affiliated with Pulp Figures in any way, just a fan) There are many suitable figures across his various ranges, but these are from “Weird Menace.” I know some are a little anachronistic for 1895, but I like my VSF a bit pulpy. I strongly suggest you take a look, as many of the weird science stuff would work for IHMN as well as do double duty for pulp gaming. 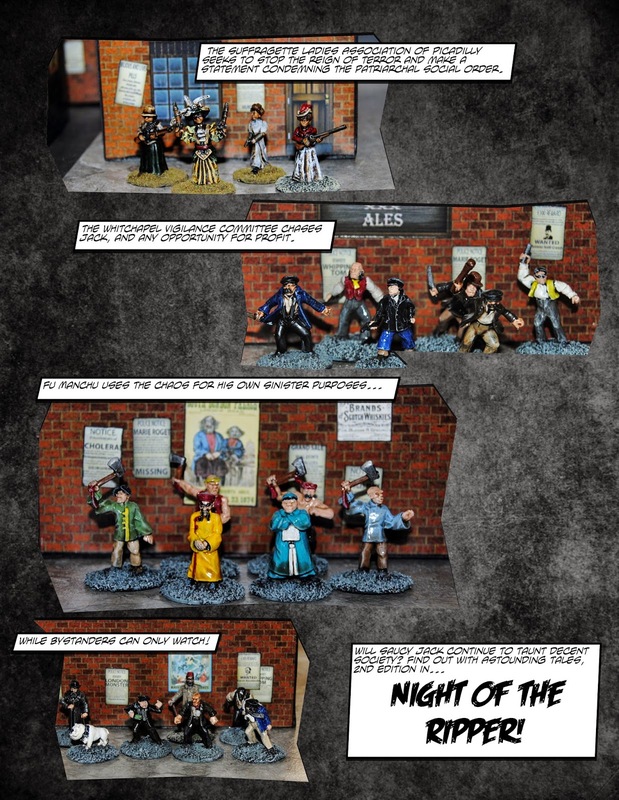 • Crowley: PWM 01 (Weird Villains 1) – I personally use a cult leader I found in a box of Hellboy miniatures, but the Crimson Scorpion from this pack would be perfect, plus you get a few more interesting, menacing figures. You could also use a figure from PWM 07 Cowled Cultists. 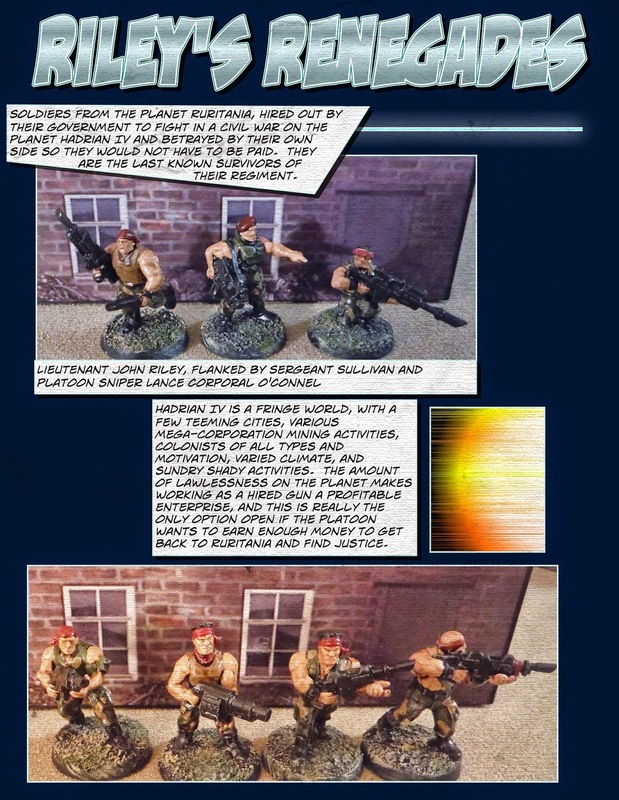 • Acolytes: PWM 08-09 (Gas Mask Cultists) – These two packs will give you guys with military rifles, a flame thrower, a machine gun, and a couple of WW1 Bergman sub-machine guns. There are several other useful cultist packs, but most are armed with 1930’s style weapons like Thompsons. • Lesser Old One: This guy I treat pretty much as a greater demon from HVF. 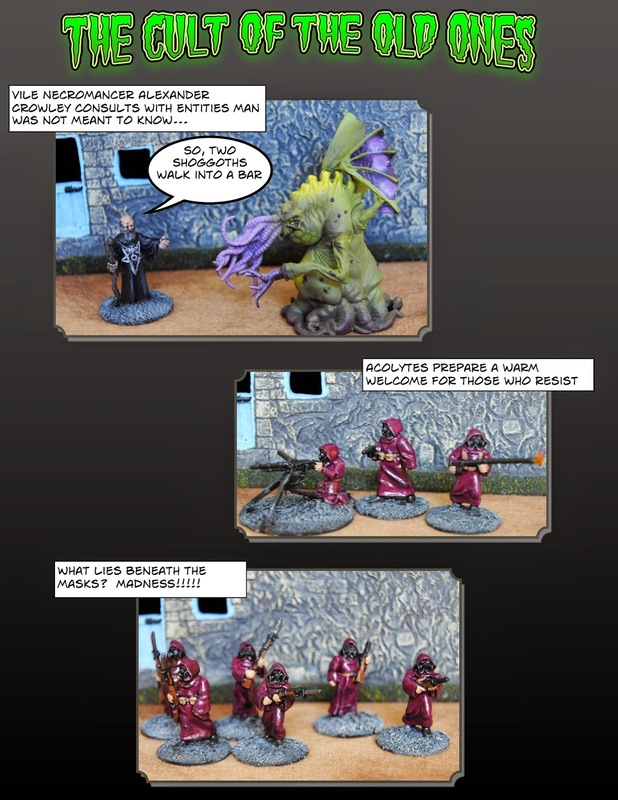 Unfortunately Mr. Murch does not have an appropriate figure, but there are many Cthulhu mythos inspired figures out there. I use a repurposed Monsterpocolypse monster. I apologize for the lack of updates, it has been a busy summer, with gardening, camping, a cruise in July, and general family skulduggery. As Mrs. Tin Man is a teacher, our summer's get pretty busy. I did get the awesome print for Father's Day of General Gordon himself! It hangs proudly in the game room. Last weekend, Tom was kind enough to drive up for my first game of Black Powder with my 6mm Napoleonic troops. In short, I really enjoyed the rules and think it gave a fast, but good game. Nothing illogical happened, and the command rolls added a nice level of tension. We played on my new 3' x 4' table, at 1/3 scale, which worked pretty well. Infantry battalions in line had a n 80mm frontage (with 32 figures), a single infantry move was 4" and musket range was 6". We played down the long axis of the table, which was the equivalent of a 9' by 12' table at normal scale! All entered in column on Tom's end of the table. Tom sets up as I prepare to feel the full fury of the Hapsburg's! Things started heating up on my left flank, as the Grenzers moved to assault the light battalion in the wood. They would drive me out eventually, but at the loss of one of the Grenze battalions breaking. On my right / Austrian Left, I had left my artillery battery exposed, which Tom, nicely took advantage of and sent his Hussars charging in! He needed 3+ to hit, and when he rolled his attack dice, he rolled all 3's... Needless to say, my battery was wiped out. Lesson learned, don;t leave artillery hanging out by itself, unsupported. ... that delayed me long enough that he was able to overrun my forward brigade in heavy fighting. I greatly enjoyed the rules and I think Tom did as well. We came to a decision in 3 hours of play, and that includes stopping to look up rules, snack breaks, etc. Thanks Tom for a great game, and I cannot wait for a rematch! Here is a quick review of my Austrian army for the 1809 campaign. All figures are from Baccus, and all figures, except for the Grenzers, were painted by Reinforcements by Post about 5 years ago. The Grenzer and bases were painted by me. I currently have order a few more troops to fill out the order of battle, including Lanweher and Jaegers. The troops are mounted on 20mm x 20 mm squares from Litko, with flex steel on the bottom of the bases for storage with magnets. The light cavalry contingent consists of 4 regiments of Hussars, organized in to 4 base units, for a total of 12 figures each. These will be handy brigaded together or as part of an avant garde brigade. The heavy cavalry consists of 3 regiments of Cuirassiers, ready to charge for glory! The core of the infantry consists of 43 bases of 8 figures each, 344 figures total! I usually organize them in to 4 base battalions, but I can build large 5 base units. I somehow only wound up with 8 command bases, so any more than 8 battalions leaves a unit or two orphaned without flags. Big, strapping chaps ready to give what for to the frog! Four battalions of converged grenadiers. Three battalions of Grenzer from the Turkish border, deployed into skirmish formation. For now, I will play with Grenzer exclusively as skirmishers. So far, these are the only troops I painted myself. I did not get any close up shots of the artillery, but I have 10 bases organized into five 2 gun batteries. I am going to fill out the force with several battalions of Landwher and a couple of battalions of Jaegers. Oddly enough, I have also ordered extra figures in order to play Sharp Practice at half scale in 6mm. Madness? Perhaps... I did enjoy my solo excursion with Black Powder, but am not sure I got all of the rules right, so will give it another spin soon. Still finishing basing the French, so until next time, happy gaming! His excellent article outlining his philosophy can be found here, if you are unfamiliar. Anyway, with various life upheavals, I have never come close to bringing a 6mm project to completion... until now. I finally pulled them out, based them up, and began to work on terrain for them. I will show off the troops and talk rules in future posts, but for now I would like to walk you through my terrain build. I am very fortunate that Mrs. Tin Man is very supportive of the hobby and we have a dedicated game room at the front of the house. Also, when we moved, I inherited our old kitchen table, which is 4 feet by 4 feet and counter height with nice bar stools. I have played skirmish games on it in 28mm, and I probably could set a 6 x 4 foot top on the table, but frankly, I don't want to. It would significantly intrude in to the room, and I'd like to be able to sit down at my nice table, with room for quick reference sheets, a drink, plaec for my elbows, and dice towers so dice don't go tumbling all over the place. Then inspiration struck via the excellent Battlefields and Warriors blog. I have been following Norm's pin board gaming project, and it inspired me to try something similar myself. A quick read through my copy of Black Powder finally locked my plan in place. "Standard" infantry frontage is 240mm. My 6mm armies are based with four x 20mm square stands per unit, for a total frontage of 80mm. Scaling Black Powder down to 1/3 scale is my perfect solution!!!! Unit movement rates will still be easy enough, with infantry moving 4 inches per move. And best of all, a 2' x 4' gaming board would equate to a 6' x 12', just like the Perry's play on! I could put it on my table and still have room for elbows, sheets, etc. and game sitting down in comfort, with enough room to maneuver 32 figure battalions! First, there was a visit to my local lumber store for a 2' x 4', 1/2" thick oak project panel. I also bought the same thing in 2' x 2' to use for hills, more later. I also went down to my local train shop and bought a Woodland Scenics grass mat. I purchased the "Grass Green" version, next time, I will go with "Summer Grass," as it does not quit look so much like a golf course. this is a neat product, basically a flocked, vinyl mat. I cut it roughly to fit, glued it down with white glue, rolled out the air bubbles with a rolling pin, stack books on it, and left it to dry overnight. After drying overnight, I went back and trimmed the excess on the edges with an exacto knife. My original plan was to frame the edges with molding, but my attempts to miter the corners with a hand saw failed miserably. So, back to the home improvement store. I purchased some oak strips that were 1 1/2" x 1/2" and decided to frame the bard with that, no mitering required. The downside is that I lose 3" off of the 2' depth of the board, but it was easy to cut and gue, then nail in to place using small, brass nails. The next step was to head to the garage and using my trusty jig saw, I cut out hill shapes with a 45 degree slant. Fully contoured hills look amazing, but I am looking for practical and would like to be able to indicate substantial elevation changes on my table if I want to. The raw results look like this, with a lone 6mm battalion wandering the field. I next went back outside, and spray painted the hills with the cheapest brown spray paint I could find. Green may have been a better pick, but brown blends OK too. I then cut pieces of the grass mat and glued them down to the tops of the hill sections. Hills were done, now I needed some woods. Years ago, when I had the troops painted, I also picked up a box of trees on the cheap from a model railroad supplier from China on eBay called "We Honest." I have to say they are, because I got a couple hundred trees in the mail in less than a week, and if I need mroe, I will certainly buy from them again. I started out making tree based from some black foamcore I had laying around, beveling the edges with an exacto knife, gluing small pieces of the grass mat to the top, and painting the edges green. I finished them off by gluing down trees to the perimeter, ad I read about as a kid in a CS Grant book, Wargame Tactics. It does not look to bad, here are some 6mm individually base sci-fi infantry wandering passed a copse. And here is what the finished table looks like with a Miniature World Maker road, farmhouse from Baccus Miniatures, and field from the carpet sample pile at Lowe's! I am playing a solo game to learn the Black Powder rules, and have made quick reference sheets that scale the game down to 1/3. I am running identical Austrian and French brigades against each other, will provide some commentary in a future post. Here is a closeup of some of the French. And here are the Austrians! So there it is, my gaming table. I intend to do a desert version for the Sudan, and both will work for the 6mm Sci-Fi skirmish stuff I want to do. Just goes to show you, you don't need a huge area to have an enjoyable, pretty game!